"The race is on, in Death Rally, where life is short & hot, fast & deadly. Watch the road, hear the rumble. Start out easy, get the feel of it. But remember: by the rules or fry the rules, play to win. 'Nuff said. Now ride your machine, your motor-war-chariot." Death Rally is a Driving Game developed by Finnish studio Remedy Entertainment and published by Apogee Software in 1996. It was one of the last titles to be published under the Apogee name. The game's menus are all 640* 480, 256-colour graphics, but the actual races are only at the standard 320* 200, 256-colour resolution. The actual races use the classic top-down viewpoint; if you've played the Micro Machines games, you'll know what to expect. The cars are sprites but some elements of the track are in 3D. The player can drive under street lamps and signs, see parallax on rock formations and buildings and drive through tunnels. The game can be played with or without weapons (although weapons make things much more interesting) and the player can even run over the bystanders on the side of the track, although it shouldn't be done intentionally as it slows the player down and damages their car. The original game supports up to 4 players over an IPX network, along with two-player modem and serial-link multiplayer which was standard at the time of development. In October 2009, Remedy released the game as freeware, and also ported it to run on Windows, Vista and Windows 7 included. If the player wants to play multiplayer, they have to use the DOS version and make use of DOSBox's IPX over TCP/IP emulation. A reboot of the game was later created, first for mobile consoles, then for PC. Aerith and Bob: The AI opponents get names such as (Iron) John, (Diesel) Joe, (Nasty) Nick, Clint (West), Liz (Arden, short for Elizabeth) Sam (Speed)... and also Mic (Dair), and Cher (Stone). The Aggressive Drug Dealer: Occasionally, he offers the player a mission. Pick up some drugs on the side of the track and then come in first to get a cash bonus. One of the few reasonable ways to beat The Adversary is to place mines in the right place so he crashes trying to avoid it every lap. This also counts for normal races. In the normal tracks, the player can push opponents to the outer-centric areas. They would go on loops until they find a way to get out of it. Since the AI follows a specific track, planting mines on this trajectory is usually a sure hit. Animesque: The GUI's faces are drawn in this style. The only exception is, of course, Duke Nukem. A Winner Is You: The freeware release has the final cutscene replaced with nothing for no reason at all. Alliterative Name: Bogus Bill, Mad Mac, Matt Miler, Motor Mary, Nasty Nick, Sam Speed and Suzy Stock. A.K.A.-47: Except with cars instead of guns. The Vagabond (Volkswagen Beetle), Shrieker (Pontiac Trans-Am), and Wraith (Porsche 911) are all recognizable real cars, and the Deliverator is based on the Mach 5. Awesome Mc Coolname: Several of the opponent drivers, some with Xtreme Kool Letterz, and all the available vehicles. There aren't many things that can describe a man racing in a muscle car as gloriously as Dark Ryder and his Shrieker, for example. Badass Driver: The Flame-Crowned Demon King of the Race - The Adversary. Or the player, if the player beat him. The other drivers to an extent, especially Duke Nukem. Big Bad: The Adversary is alternately spoken of as either the demonic ruler of the "road-hell purgatory", or just a really, really nasty driver. True Tom's usually cryptical speeches about him doesn't help. He does tell the player straight out, however, that the player should be afraid of him. 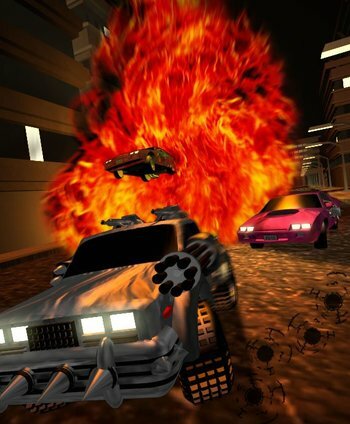 Car Fu: The player's machine gun has very limited ammunition, so the player's other primary weapon is ramming the opposing cars into obstacles, mines, innocent bystanders, and each other, preferably with spiked bumpers on. Cast from Hit Points: The Rocket Fuel is an enhanced Nitro boost. The catch is that every bar damages your car. The Deliverator, the so-called "Prince of the Race", visually inspired by the Mach 5 and bearing a visual resemblance to the real life Alfa Romeo 33.2 . "Cybernetic roadwarrior, the player's car is the player's body. And this is not just any body, it is some body." The unplayable Adversary's car, a modified Deliverator with a huge jet engine attached to the back. Cool Shades: The assassination contractor wears a visor, and several drivers wear shades such as Diesel Joe, Dark Ryder and of course, Duke Nukem. Critical Existence Failure: In the main race, cars do not show any damage in the race or suffer reduced performance until damage hits 100%, at which point they become flaming wrecks... which can be restored with a bit of luck at the right time, and an opponent bumping the player to touch a nearby item. However, provided that the player play with the extended GUI instead of the reduced one, the picture of the car on the left does show increasing amounts of damage, and the player can see the damage meter of other cars. Determinator: True Tom sees the player as one, when he's not patronizing the player as the Young Gun. Developers' Foresight: Taking many shortcuts in order to save time not only slows your car down, but also gets you penalized. Difficult, but Awesome: The Utopia/Complex and Holocaust/Toxic Dump tracks are the most intricate tracks of the game, but once the player knows the valid shortcuts and the quick steers, and knows how to manage Nitro usage, they become really easy, to the point where the player can even lap some cars. Early Game Hell: You can be piited, in the Easy tier, with the complex track Holocaust/Toxic Dump. Easter Egg: It is possible to play as Duke Nukem simply by selecting his portrait. But if the player then goes so far as to actually enter "Duke Nukem" as their player name, the player will hear some of his various one-liners throughout the game and gain his armor. Every Car Is a Pinto: The vehicles burst into flames when destroyed. They remain as burning wrecks on the track for the rest of the race. Oddly enough, it is possible for a wreck to come Back from the Dead if it is nudged into a repair powerup. Heal Thyself: In the form of wrench powerups that occasionally spawn on the track. Idiosyncratic Difficulty Levels: "Speed Makes Me Dizzy", "I Live To Ride" and "Petrol In My Veins". Interface Screw: Picking up the Mushroom will distort the playable area as if the driver is under drug effects. Land Mine Goes "Click! ": Available from the Underground Market. There is little that causes more damage, and nothing that knocks someone off course faster. Loan Shark: Once the player gets a Dervish or better, they can borrow money from him. If they don't have enough money to pay him back after 3 races, he'll take one of their upgrades. If the player doesn't have any upgrades, he'll damage the player's car. And if the player's car is already totalled, well... In the end, the alternatives (such as playing a race in Medium or Easy when the player has a "Hard" ranked car) often end up much cheaper than just paying the guy back. Made of Iron: As an AI opponent, Duke Nukem drives a dark red Deliverator that can take more damage than the Deliverator purchasable by the player and driven by other opponents. Mirror World: Half of the tracks are simply mirrored from the other half and given alternate color schemes. MOD: The music in the game was composed by Jonne "Purple Motion" Valtonen in ScreamTracker 3 Module (.S3M) format. Valtonen is the lead composer of the now-defunct demoscene group Future Crew. Money Sink: In order to get a new paint job, the player has to buy an entirely new car. And vehicle upgrades don't carry over. More Dakka: The first three cars (Vagabond, Dervish and Sentinel) have one machine gun, while the other three (Shrieker, Wraith, Deliverator) and the non-playable Adversary's car have two machine guns. Said guns have no purchasable upgrades, but better car = nastier guns. Mushroom Samba: the player's screen goes all wavy if the player picks up a mushroom and the player hears a voice saying "Whoaaaaa maaaaannnnnn~" It's worth noting that this Interface Screw also affects the AI, and in some cases it affects them more than it does to human players. Nitro Boost: If weapons are enabled, the player can buy the Rocket Fuel powerup before a race from the Underground Market, which replaces their regular boost for an entire race. The catch is that it damages their vehicle when it is used, although it does speed the player up much more than the regular boost. On the other hand, the player's regular boost isn't as powerful but does not damage the player. Two "Medium"/"Hard" level tracks, Velodrome and its mirror Eidolon, have "speed strips" the player can drive on to speed themselves up. No Celebrities Were Harmed: Some of the opponents in single player have names like Greg Peck, Jane Honda, Cher Stone and Clint West. No-Damage Run: Finishing the race with 2% or less damage with weapons enabled does give the player a nice bonus, with the sponsor claiming not a scratch on it. Players can fake out a pristine-quality car by picking up enough repair powerups to reduce their vehicle's damage to the required range, but as far as the sponsor is concerned, it was untouched. "It was a snowball's chance in Hell. Through that Bullet Hell blitzkrieg, and not a shadow of a scratch on your paint job." "Oh this is no good, you've been lapped." Pacifist Run: The player may choose to disable weapons, making it a normal racing game. There're no bonuses for 2% of damage or destroying all the cars, no Professional Killer, no drug dealer, and no Loan Shark; and while the player can still ram opponents, it's only useful to slow them down rather than knock them out completely. The repair bills tend to be high, but the player can focus on improving their car instead of thinking about what to buy in the Underground Market. The good thing is that the bonus for winning streak is still there. "Zillions more miles to go. That junk of yours is no juggernaut. She won't take you all the way... Evolve, improve, better, best. BUY, and be one shining perfection." Powerup: Pickups that can be found during races include cash bonuses, repair kits, Nitro recharges, extra ammunition and...mushrooms. Racer Boy, now I'm going to mow you dead. Occasionally, a race sponsor will offer a cash reward if the player takes out a specific racer. The amount the player is rewarded with is based on the race difficulty. The Grim Reaper himself will reward the player for destroying all the other racers. Screw the Rules, I Have Money! : One of the services of the underground market is for-pay sabotage. For the right price the player's highest-ranked opponent will start the next race with a damaged car (up to 50% worth, but usually somewhere around 35%). Fortunately for the player, this is the one service from the underground market the AI will never buy. However, sabotage is unavailable when the player go up against the Adversary. "What? you crazy, man? Nobody touches the Adversary's automobile and lives, nobody." Several of the drivers (barring Duke Nukem) have names referencing other characters or real life people: Bogus Bill, Farmer Ted, Cher Stone, Greg Peck, Clint West, Mad Mac and Jane Honda. From Duke Nukem: the player can select him as the player's portrait, and there are various one-liners such as "Let's Rock" and "Hail To The King, Baby". If the player takes between 50% and 60% of damage during a race, (or, if the player took more, fix until reaching this range) the Repair option will invoke Duke Nukem's "Uhoh, that's gotta hurt" one-liner. "Warp 9, Captain. No problems with traction now. The finish line, she's closing fast." Spirit Advisor: In between races, the player can read messages from one True Tom Rhymer, a racer who was slain at the hands of the Adversary after he dared to challenge him to a race. He speaks to the player from his car-coffin grave, offering the player advice with a religious reverence for cars, racing and the long road that lies before the player. "Things can get out of hand real speedy like, racer boy. Listen to True Tom. I tell no lies." Too Dumb to Live: The bystanders who can get shot down or ran over with your car or your rivals'. Top-Down View: The default and only in-game camera in the game. Vehicular Combat: Any time the player plays with weapons enabled. The Grim Reaper himself hands the player a cash bonus for wiping out all three of the player's opponents by the end of the race. Don't try to take out Duke Nukem though; he's got thicker armor then anybody else save The Adversary. Weaponized Car: Every car comes equipped with machine guns, and the player can add mines and spiked bumpers into the mix.